The most hysterical response to a Washington Post cartoon depicting Senator Ted Cruz’ daughters as monkeys has got to belong to Peter Johnson, Jr. who insisted that the cartoon is a form of child abuse. I thought Meghan McCain’s reaction to the cartoon, in which she suggested that the Cruz daughters would be scarred for life, was over-the-top. But Johnson, Roger Ailes' personal attorney and Fox News stand-in, took the derangement even further. The “child abuse” meme began with host Clayton Morris “just asking” if the cartoon was “a form of child abuse.” FoxNews.com “just asks” the same question in its title for the video, below. And – surprise! Johnson thought the cartoon child was abuse. JOHNSON: I hate to be judgmental, especially in this Christmas season, but I really do think it’s a form of child abuse. And so don’t hide behind the First Amendment and say well, Senator Cruz you put your daughters in play and so The Washington Post can now call them little monkeys. Actually, The Post never called the daughters “little monkeys.” The cartoon didn’t even really portray them as little monkeys. 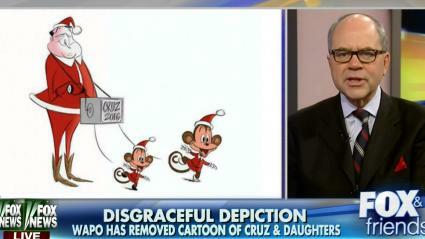 The cartoon depicted two monkeys on a leash that were references to Cruz’ daughters. Of course, Morris did not correct the record. Apparently, Fox News viewers are not siding with Ailes, I mean Johnson on this one. Morris noted that the viewers are “kind of split” on the cartoon because Cruz put the girls in his campaign ads. Morris “forgot” to point out that Cruz circulated the cartoon in order to fundraise off it, thereby possibly ensuring that more people see it from him than from The Washington Post, which pulled it. It wasn’t until more than two-thirds into the interview that Johnson finally acknowledged that there would not and should not be any legal repercussions from this “child abuse.” He said, “I think from a moral perspective it’s abuse. They’re not going to be put in jail.” This, despite the fact that Johnson was introduced as a Fox News legal analyst there “to weigh in on the legal side” of the child abuse question. “No one is saying they should go to jail for it and there’s no physical harm but it’s emotional abuse,” Johnson now argued. Watch it above, from the December 23 Fox & Friends.